From early morning to late evening check out the best dealers, tournaments, guests, performances and fun in retro gaming paradise at the annual Vancouver Retro Gaming Expo 2014. Unlike similar events in other cities, Vancouverites like to party. They’ve taken the basics of: Vendors, Gaming, Tournaments, Panels, Costumes, etc. and spiced it up a bit with a licensed venue, some awesome old-school music, live bands, special guests and some gaming themed burlesque. 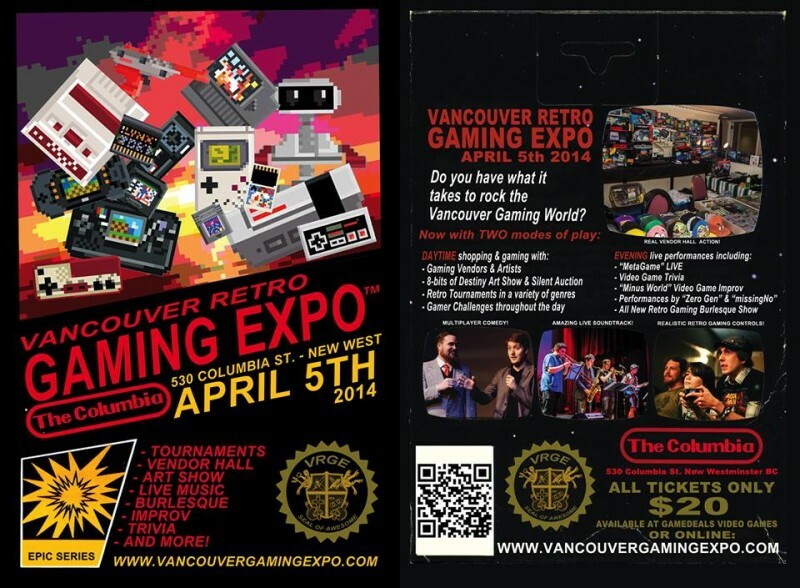 The Vancouver Retro Gaming Expo, taking place on April 5, will remain a smaller 500-800 person event in the spring, while the larger (modern-themed) Vancouver Gaming Expo has now merged with other conventions into one big summer con known as Northwest Fan Fest to be held at UBC. All-new retro gaming Burlesque show. Drinking and driving don’t go together, unless you’re playing Mario Kart. This tournament will bring out the road rage in all of us. Bring your A-game, you’re going to need it. One of the most popular fighting series of all time shows it’s roots in what will likely be the most popular tournament of the weekend. The original puzzle game straight from Russia, think you have what it takes? Mario is not really a Doctor, and if you’ve never played Dr. Mario you’re not really a gamer. One of the puzzle genre’s finest. Classic 2D fighting at it’s best. They’re going to drop the bomb on this tournament, or at least you will drop the bombs in the game. Still undecided on version/system (not 360!) but there will be multiplayer bomberman action. Entered into a draw for cool door prizes.